“This building” is the sprawling structure perched on a 10,000-square-feet of prime real estate — a corner lot with parking in the heart of old Ballard. It’s the one the chef/entrepreneur and her husband and business partner, John Casey, bought 12 years ago, before turning it into a multifaceted culinary center and special events facility. Back then, Ballard was not the collection of condo complexes and hot new restaurants, bars and boutiques we know today. And the Caseys say they’ve long viewed their building at 5130 Ballard Avenue — as well another piece of prime real estate in the heart of Ballard bought and since sold — as investment property. The big brick complex eventually encompassed Dish D’Lish — their 2-year-old flagship retail store and cafe. Like its short-lived predecessor in Pike Place Market, the Ballard store — built as a company prototype and training facility for future cafe locations, as well as a showcase for Kathy’s signature products — opened with much fanfare. It’s slated for closure late this summer after the Caseys make their move to the waterfront. Meantime, its Sea-Tac Airport siblings are said to be doing very well, with revenues up by 25 and 23 percent respectively over the past two years. Plans remain afoot to expand the Dish D’Lish brand at other airports through a co-licensing agreement with HMS Host. 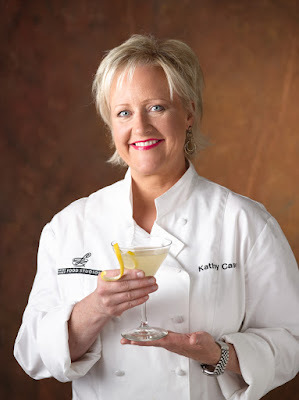 “Everything is gloom and doom out there, but my consulting business is doing fantastic,” says Kathy, adding that, as ever, the blogospheric gossip-mill is working overtime, with rumors flying thanks to news about the downsizing and closure of her flagship shop. “I try not to read it,” she says. “I’ve had my business for 20 years, seen the ups and downs and weathered them,” she remarks with her trademark laugh. “If the economy is starting to get slow, I get slow eight months ahead of time, and if it’s going to pick up, I feel it eight months ahead of time. I felt the [recent] slowdown before it hit here because I do a lot of national and international work.” Today, however, biz is on the uptick. Asked to regale me with a look at what her calender might entail, she describes her schedule. Last week, that included creating cocktail recipes using Remy VSOP for one client (Remy Cointreau), and preparing recipes for heirloom tomatoes and mini-cucumbers — destined for product labels and the company Website for another (Canada’s Sunset brand produce). She created recipes for maraschino cherries for the national cherry commission and developed summer cocktails for Drinks Magazine; worked on the outline for a her new book celebrating North America’s top mixologists, soon to be signed-off by a major publisher and tested meatball recipes for IKEA’s Great Meatball Contest — a consumer cook-off to be held this coming weekend. But wait, there’s more! “I did my KOMO radio spot, Dishing, a weekly gig which ties to my blog and a bunch of interviews fro my new book, “Sips & Apps” — due out next month. Oh, and she also got word that she’s got “a fantastic gig” with Cuisinart, one that will have her flying to Las Vegas next week for a video-shoot: “I’ll be on the DVD that comes with every Cuisinart,” she says, noting “I did the happy dance” when the happy news came down that she’d won that big contract. When she makes the big move — essentially recreating her Food Studios and Liquid Kitchen at Salmon Bay — she’ll be divesting herself of other excess poundage. With less space, “I have to get rid of some stuff,” says the self-described pack-rat, including an industrial pasta-maker, three sausage stuffers, an oversized grain-mill and other “monstrous things” that came along with more practical goodies when Kathy bought the TV studio-set that once belonged to the late Frugal Gourmet, Jeff Smith. “But I’m not getting rid of my cotton-candy machine!” she says. When I asked about the prospects for her building’s sale during this economic downturn, Kathy says she’s convinced sales for commercial real estate like her Ballard building remain strong. “When we bought it it was not dirt-cheap, but we couldn’t have made a better investment. The building is zoned NC3 so it can go up multiple stories.” On a more personal level, she says, the sale will allow her husband of 28 years, who handles the real estate end of their business to travel with her as she seeks out more opportunities to promote herself and her brand.